Felons may have to learn new skills or start a different career after their incarceration ends. There are resources available as many employers have found that felons make good employees. Those with experience in the beauty and skincare field may think of becoming a cosmetologist. 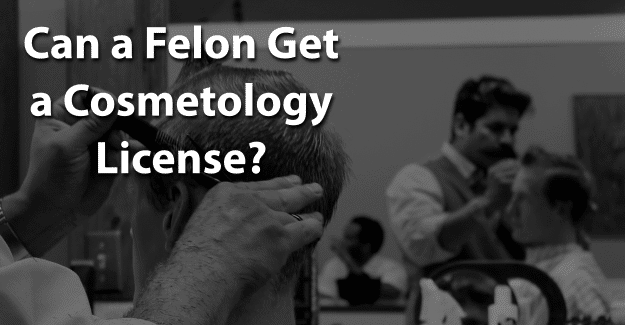 This blog post will address the issue of whether or not a felon can get a cosmetology license. What is a Cosmetology License? What is Required to Get a Cosmetology License? A license is issued by a state agency to practice a profession and is required in order to call oneself a licensed professional. A license shows that someone has the specific knowledge and skills necessary to do a job. Typically, these types of credentials are attained after meeting certain educational requirements. Licenses are legally required by the government to work in an occupation. A cosmetologist license from a certificate program allows someone to perform basic hair, skin, and nail care services, although most states have separate licenses and requirements for different areas of health and beauty. Requirements to get a cosmetology license differ from one state to another. The minimum age for licensure as a cosmetologist is typically between 16 and 18 years of age. To enroll in a board-approved cosmetology training program, most states require an applicant to have a high school diploma or a GED. To obtain a license in cosmetology, someone must complete all the state requirements, including attending a licensed beauty school and completing all course work. A person must also pass a licensing exam offered by the particular state. Regardless of the state, a cosmetologist is legally required to have a state license and must complete a state-approved cosmetology school and pass a written and practical exam. A typical cosmetology program includes approximately 1500 hours of instruction. Cosmetology programs may be offered through the schools, community colleges, and vocational schools. Someone graduating from one of these programs will either earn a certificate, a diploma, or an associate’s degree. Most cosmetology schools allow students to achieve a certificate, which typically takes between 9 and 15 months to complete. Certificate programs in cosmetology include all training required to become licensed in cosmetology. Cosmetology license requirements differ from state to state. These requirements don’t specify anything regarding criminal convictions. Typically, obtaining a cosmetology license is focused on training and education rather than on criminal convictions. There are state departments involved with licensing and regulating businesses that may be stricter and fall under the Business and Professions code for that state. The board will approve or deny licensure after evaluating the entire application and supporting evidence. It’s important to be honest when applying for a license as a cosmetologist. If a felony isn’t disclosed but is found on a background check, this constitutes fraud and is punishable. It’s a crime to falsify an application which could result in being sent back to prison. Having their record expunged can give felons the chance to begin with a clean record and succeed in getting a cosmetology license. Expunging a criminal record allows anyone to honestly state on an application that he or she has not been convicted of a crime. There are re-entry programs, such as drug treatment, and educational opportunities for felons who need them. For many felons, having their felony expunged can give them the chance they need to begin with a clean record and succeed in getting a cosmetology license. It’s a significant challenge, but it might be worth it for a felon that wants to get a cosmetology license. Having his or her record expunged and documenting any training programs or additional education could make the essential difference in a felon succeeding in getting a cosmetology license. What do you think about this blog post? Have you or someone you know been in the situation of trying to get a cosmetology license with a felony? What was that like for him or her, and how did he or she achieve success? Please tell us in the comments below.